The next leg of my whirlwind, three-week jaunt through Europe took me to our neighbors to the west, good ol’ France. Two days after my Easter trip to Budapest, I took off for Frankfurt to catch an overnight bus. This was certainly an experience in itself. Our bus departed the train station in Frankfurt at 9:30 p.m., set to arrive at 7 a.m. the next day – yech. It was, however, 40 euros cheaper than taking the train. The trip included an hour-long stop in Metz, France, which I hear is lovely, but less so when you’re at a gas station at 2 in the morning. Overall, I think the bus ride went as well as could be expected. You’re never going to sleep well sitting on a bus for nine hours, but I at least was able to sleep a few solid hours. We got into Paris at around 6:20 a.m., which was a bit confusing for my travel companion, Larissa, and I, since it meant we were 40 minutes early. I asked the bus driver in German if this was the last stop (we had made some stops previous to this one), and as far as I could tell he affirmed this (and probably also thought we were a bit daft for even asking). So we wandered off the bus, uncertain what we were going to do until my friend Kaellen met us at 7. Luckily Kaellen, who studied in Paris this semester, was running on time and we didn’t have to wait too long. We hopped on the Metro to go back to her apartment (she spent the semester living with a host family) to drop off our bags. On the way, we stopped at your stereotypical French patisserie and got a stereotypical pain au chocolat – basically, croissant-type bread filled with chocolate. And, in short, it was amazing. It was amazing how something as simple as a croissant could be a thousand times more delicious in Paris than anywhere else I had ever had one. Sufficiently energized for the day, we set off on our sightseeing expedition. The first stop was Notre Dame. Upon arriving, I realized that I think church fatigue has finally settled in for me. I have heard all my other friends who have studied abroad in Europe express the same sentiment again and again—no matter how cool or beautiful they are, eventually you will get sick and tired of seeing so many damn churches all the time. Don’t get me wrong – Notre Dame is a beautiful church. But I think the Dom in Köln was definitely the high point of all the churches I have seen, and so everything after is pretty, but not exceptional. It’s weird to even write that – weird to think that I’ve seen enough in Europe that I can say the Notre Dame is lovely, but nothing exceptional. We did however pay the 5 euros to climb to the top of the Cathedral, and that was absolutely worth it. It was a long climb on a very narrow spiral staircase, but we were rewarded with a great view of Paris as well as the upper parts of the cathedral. We were able to see some of the gargoyles up close as well as to explore the Belfry, where much of The Hunchback of Notre Dame takes place – pretty cool! From there we went to find lunch, using a guidebook Kaellen had to select what we hoped was a tasty and reasonably priced French restaurant. I had a sort of open-faced roast beef sandwich for about 10 euros, which was quite pricey for me but reasonable by Paris standards. We stopped by the Pompidou Centre, which houses a modern art museum, among other things. The building itself has a very modern design, looking sort of like the outer walls were stripped away, exposing a network of structural beams and escalator tunnels used to get to the top. The elevator attendant on the outside of the building was nice and let us go straight up into the building, instead of having to wait in line for tickets (which I believe would have been free for students, but at least we saved time!). There wasn’t a lot to see up there besides the art museum, but at least it provided another nice view of Paris. Our last major stop of day one was the Louvre. We went in knowing there was no way we would be able to see everything, instead intending to just hit the highlights. The Louvre is a museum whose scale you’ll never truly appreciate until you visit it. I knew it was huge, but seriously – it’s HUGE. I was just overwhelmed by how many rooms full of priceless collections there were. 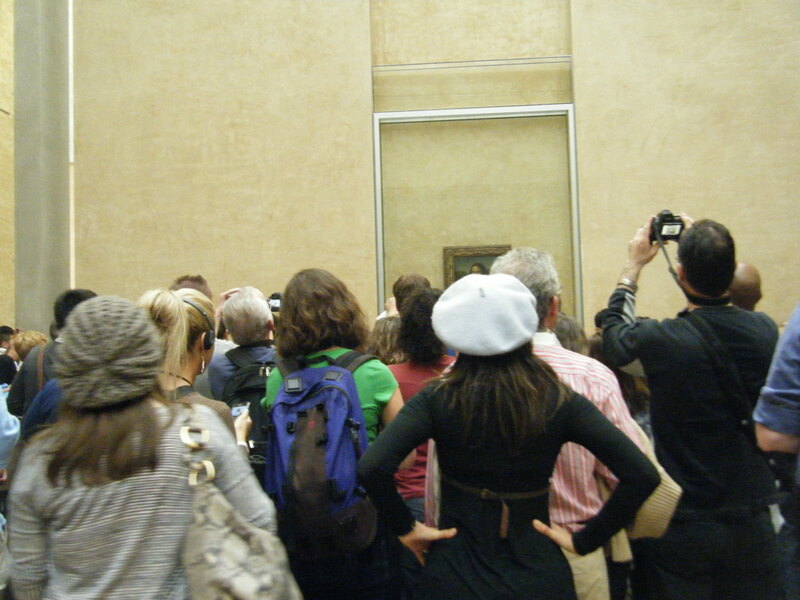 Somewhere back there is the Mona Lisa... also note pretentious beret-wearing art snob with hands on hips. We saw the Mona Lisa (of course) which, like everyone says, is much smaller than you expect. The crowds there actually weren’t as bad as I thought they would be – certainly, there were a lot of people, but it actually didn’t take that long to get close. It would have been nice to been able to stand there longer though and actually appreciate the picture, instead of feeling like you have to take your picture and then get out of the way for the next person. The next day we all met up in the Luxembourg Gardens. One thing I did not realize about Paris that there are dozens of gardens across the city, all saturated with perfectly maintained hedges, elegant fountains and beautiful flowers. So they’re all quite lovely, yes, but the novelty does wear off quickly. From the gardens we headed to the Pantheon, which as far as I could figure out is basically France giving itself a pat on the back. Ok, that’s probably not a fair reduction of the building – it’s primary purpose is to serve as a place of entombment for prominent French men and women, such as Rousseau, Voltaire and Marie and Pierre Curie. The architecture of the building itself was very classical, and reminded me a lot of the Capitol building in Washington D.C. The Arc de Triomphe was our next stop. 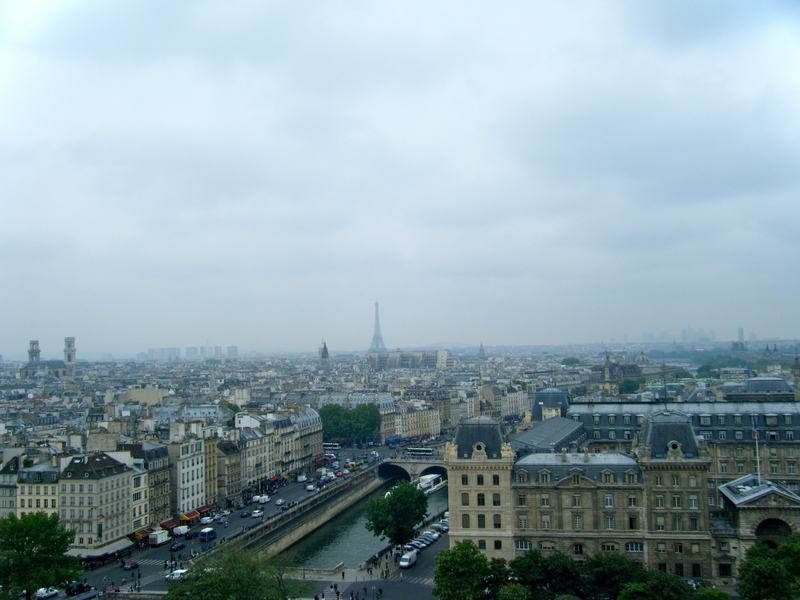 It’s possible to go to the top of the Arc and get yet another panoramic view of Paris, but Larissa and felt that would have been a bit excessive, since we had already seen the city from Notre Dame and the Pompidou Centre and still had impending visits to the Eiffel Tower and the Montmarche. Still, the Arc was an impressive sight from the ground, definitely bigger than I had realized. I particularly liked all the detailing on the Arc, with reliefs on the sides depicting angels charging into battle or something like that. It looked epic. The rest of the day featured some ambling around the Champs d’Elysee and various other pretty parts of Paris (this is my way of saying we saw a lot of things that seemed significant but I have no idea what they were called and I am too lazy to look them up). 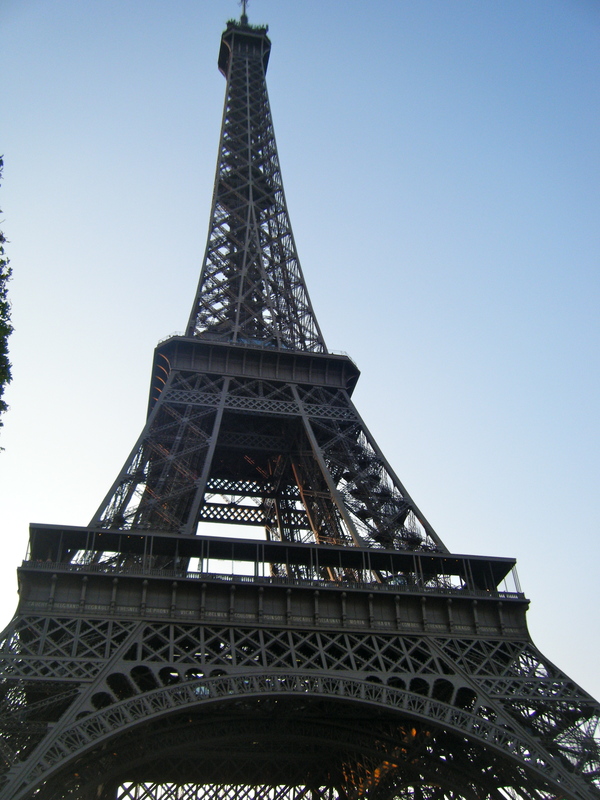 In the evening, we headed to the lawn of the Eiffel Tower for a stereotypical meal of wine, cheese and baguettes. When in Paris, one must do as the tourists do. We got there in the evening, and immediately I was overwhelmed at how many people there were. The lawn was full of people doing exactly as we were as well as children playing soccer, dogs running around and the omnipresent vendors trying to sell you five key chains for the low price of one euro! I quickly became disenchanted with the overall environment. The space was just so crowded, the vendors too persistent and numerous, and the soccer-playing-folks too inconsiderate of people trying to sit and enjoy the day. The final straw was when someone’s dog – off its leash – suddenly jumped into the middle of our picnic and began eating our food! If that wasn’t bad enough, the dog’s owner simply laughed, grabbed the dog and walked away without so much as an apology. The magic lost, we quickly packed up and moved to get in line to actually go up the tower. We had timed our visit so that we would either make it up around sunset or nighttime, hoping that either way it would be a distinctly pretty view of the city. The process of going up the tower was a bit overwhelming – there were just many people, several different lines, and vendors! Vendors everywhere! Luckily Kaellen had done this before and was able to steer us in a shorter-looking line. I’m not sure how long we waited for tickets and then to get into the elevator, but I don’t think it was more than 45 minutes, so not too bad. Like many other things this trip, the tower is just so much bigger than you realize. Standing under the base of the tower, looking at the massive steel legs supporting it, I just couldn’t believe how a structure like this could have been built before the ease of modern technology. We bought tickets to go to the very top, but you go up in stages. First you take an elevator to the middle level, get off and walk around to your heart’s content, and then you line up for the next elevator to take you to the very top. Both levels were certainly crowded, but it wasn’t too terribly difficult to find a spot against the fencing to look out to the city below. Paris at night. 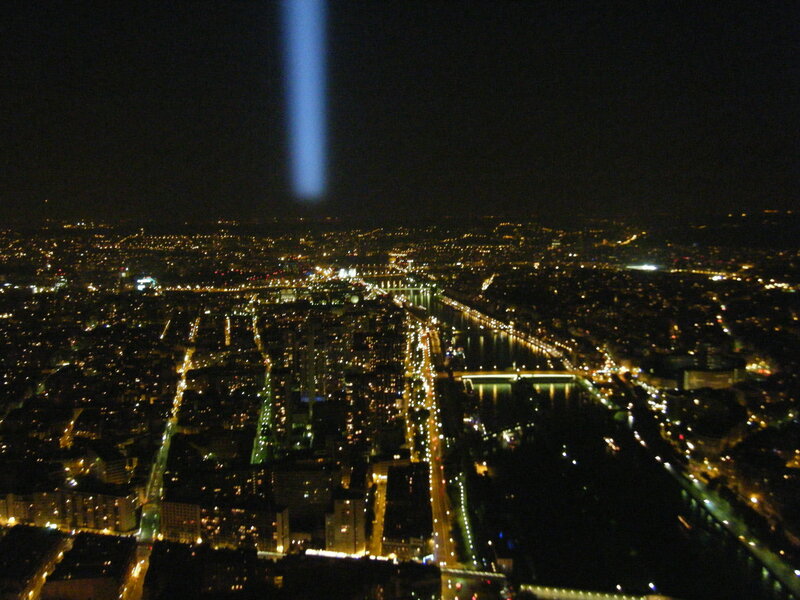 That beam of light you see is the searchlight from the top of the Eiffel Tower. I will say that the view from the middle level isn’t really all that different from the view at the very top – you probably are better off saving your money and paying only for the middle. But, I suppose there is something to saying that you went to the very top of the Eiffel Tower. The view itself is everything you think it is. It was particularly nice to see it at night though and to see the city begin to light up. Overall, this is one super-touristy destination that’s still probably worth your time, no matter how above it you think you might be. The next day, our last day in Paris, our primary destination was to see the Sacre Coeur Basilica, located on a hill overlooking the city (the Montmarche). This was something I really wanted to see, because, based on picture, the church itself looked just beautiful, and it also seemed to provide a nice view of the city. Additionally, by this time we had seen so many different views of Paris, that it really wasn’t that special to see it from the Montmarche. Sacre Coeur ended up being the most touristy thing we did in Paris, and ultimately, I just didn’t care for it. Which really is a shame, because I loved the church itself. I just couldn’t stand being near it because of how crowded it was. The last highlight of our trip to Paris was a visit to Angelina’s, a fancy coffee-pastry-sandwich restaurant. We were lured here by Kaellen’s food guidebook, which said Angelina’s had the best hot chocolate in Paris, possibly in the world. How could we resist? It was somewhat difficult to commit myself to the experience, because they also price their hot chocolate as if it is the best in Paris – 7 euros ($10, for those of you following along at home) for a personal pot. Yikes! But what’s more Parisian than spending excessive amounts of money on decadent treats? So we did as the Parisians do, and it was definitely worth the money. It was the thickest, sweetest, and tastiest hot chocolate I had ever had, and I consider myself to be somewhat of a connoisseur. Essentially it tasted as though someone had melted down rich milk chocolate bars, which is to say, it tasted amazing. Money well spent. I feel like we got as much out of three days in Paris as we possibly could have – definitely my most successful trip to date.